Ask fellow campers about "Paris Landing / Kentucky Lake KOA" and nearby attractions. Really nice park with lots to do. Only problem is the narrow roads and sloped sites. Owners and staff are very friendly and helpful. We chose a site that was pretty level so we did not have a problem with leveling. All services worked great. Quiet and well shaded. Would definitely stay again. We camped at Paris Landing / Kentucky Lake KOA in a Fifth Wheel. We stayed at this park in August for the 2017 eclipse. We got a late start looking for a campground and finally found campsites available here. Are we glad we did. There are around 40 campsites and a couple cabins, but it surrounded by beautifully manicured grounds. But the best part were the staff and owners. 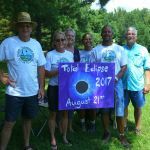 They made up a poster for the eclipse and came around and took pictures of the families with the poster during the eclipse. The pool is nice. The store was well furnished. The playroom was big and loaded with toys and games. When we left the staff all came out to say good bye. The campsites are gravel and we were lucky enough to get an end site so we had lots of room and good views. We camped at Paris Landing / Kentucky Lake KOA in a Motorhome. They also have a great mining trough for kids to pan for gems. Great gems at a reasonable price. So glad y'all came for a visit. Hope to see you again. Very nice staff. As stated earlier, some sites are 'built up' with gravel so there is a bit of a step-down when exiting the coach. Everything else good. Didn't use facilities; did use water, electric, sewer. All in good working order. We stayed here in order to have cable TV, but the connection was very bad, so it really wasn't worth choosing this campground just for that. We camped at Paris Landing / Kentucky Lake KOA in a Motorhome. Nice place to stay near Paris Landing, but Paris Landing State Park is probably a better campground. As I said, we stayed here for the cable TV, which is not available at the state park, and I wish we had skipped that and stayed at the park. Staff is friendly but sites are set up so that you have a huge step coming out of your rig to the ground, due to building up with gravel to level, but not putting enough around in a patio area. Utilities are fine and they do have cable TV and decent wifi. 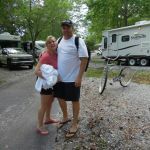 We camped at Paris Landing / Kentucky Lake KOA in a Fifth Wheel. We stayed 4 nights at Paris. Landing KOA. The owners are working hard making improvements to the campgrounds installing sewer to slips, leveling with gravel, and installing new water lines. They are adding amenities to the Park that will bring the campers out. We will stop next Fall to see progress. We camped at Paris Landing / Kentucky Lake KOA in a Fifth Wheel. We spent a 3 day weekend here. Campground host was very helpful with info on the area. Not very crowded during our stay, but temperatures were well below normal at the time. We saw a few big rigs, but most of the sites would be better for trailers like ours (26') or smaller. We camped at Paris Landing / Kentucky Lake KOA in a Travel Trailer. Golf course & marina across the street from CG. Town of Paris about 10 miles away, Land Between the Lakes and Tennessee Wildlife Preserve real close. Fisherman's paradise. There was a tree trimming company at work, when we arrived, which had the drive blocked, with equipment. The owner walked over, called us by name and welcomed us. She apologized for us having to wait, while the trimming equipment was moved and continued the conversation about how our trip in had been. The lady in the office was very friendly and led us to our site, when we ask for one with more shade, she took me to another site, which was perfect. While there a bad rain storm came through, which destroyed our awning. The host gave me the phone number of a mobile RV repairman who was able to replace the awning on our way back through. As stated earlier, these are new owners working very hard to upgrade and improve this campground. The pool was very clean and is covered every night. The baths and showers were spotless and cleaned daily. Good internet and cable. Large field for dogs to run in. All utilities worked well. Site was gravel and fairly level. Nice friendly folks, working hard on improvements, I wish them well. We would certainly stay there again. We camped at Paris Landing / Kentucky Lake KOA in a Motorhome. Very friendly owners working hard to upgrade the park. Good internet and cable. Huge field for dogs to run in. All utilities worked well. Site not very level and sewer had to run uphill. We would stay there again. We camped at Paris Landing / Kentucky Lake KOA in a Travel Trailer. Stayed here as a location to judge at the BBQ event in nearby Murray, KY. The owner was friendly and nice, the help in the office, however, could not have been slower and we might still be checking in if the owner had not come into the office. They say they have Wi-Fi but we never got it to work, in our out of the office and the check in staff did not know the password ... the park I guess is big rig friendly, but at 40' we were pushing the limits. The sites are very narrow and you are pretty much on top of each other. Lots of families and kids, a great place to be for the 4th of July. It is well off the beaten path, signs are pretty much missing so know where you are going. We camped at Paris Landing / Kentucky Lake KOA in a Motorhome. This is a nice clean family oriented park. We had my daughter's birthday party here. The folks who run the campground could not have been nicer or more accommodating. They have a huge field for campers with pets. They also have a small arcade room and a pool for kids. The only downside is that, as with most older KOA's, is that the sites are rather narrow. The park wasn't full when we camped so it wasn't a problem. We will definitely return to Paris Landing KOA. We camped at Paris Landing / Kentucky Lake KOA in a Travel Trailer. 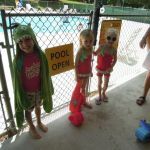 Are you affiliated with Paris Landing / Kentucky Lake KOA ?